1 drawing on paper : ink ; 5.125 x 6 in., on sheet 9.5 x 6 in. 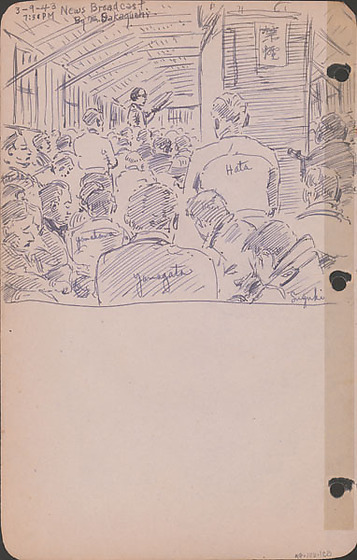 Ink drawing of crowded barracks interior filled with men listening to Mr. Sakaguchi reading the news on March 9, 1943, 7:30 PM. A man in glasses stands in profile reading aloud from a paper he holds in his left hand toward the left back of the barracks ; most men are seated and are only their heads are visible. A large rectangular object appears to the right with a sign in Japanese that reads "No smoking." Among the crowd Six men are identified by inscription in the foreground, Tatsuda, Yamakawa, Yamagata, Suzuki, and, standing, Hata. Drawing 97.106.1CA on recto of same sheet. Written in black ink, top left: 3-9-43 7:30 PM News Broadcast By Mr. Sakaguchi. Written in black ink on drawing (left to right): Tatsuda, Yamakawa, Yamagata, Hata, Suzuki.